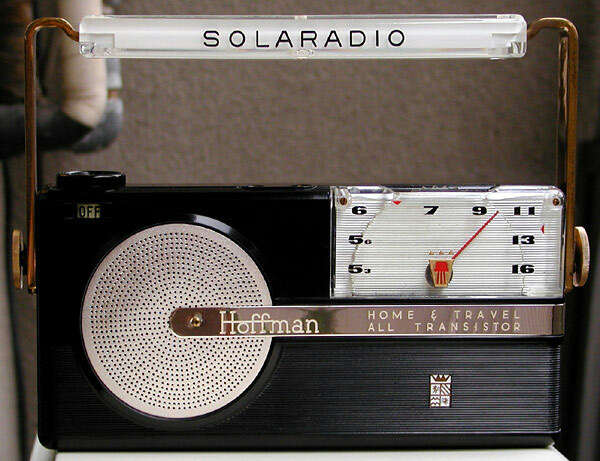 The Hoffman P411 series Home & Travel solar was a truly unique radio. Released in 1957, this monster has a lot going for it. For starters it has to be one of the earliest solar-powered radios. Not only that, but it also used rechargeable batteries that were charged by the solar panel. Yes, rechargeable batteries in 1957. Making it even more unique is that the cabinet for the Home & Travel was supplied by Sony, (actually still Tokyo Tsushin Kogyo Ltd. at that time). I believe this is the only example of a radio made by another company ever to use a Sony cabinet, thus look somewhat like a Sony. Still, there are minor differences in the cabinet, which I intend to indicate and discuss in a future update to this entry. The Hoffman P411 (and P410) series radios were available in five colours: Seal Black (K), Desert Sand [beige] (B), Turquoise (T), Calico Red (R) and Circus Pink (P).